Jobiak has assembled some of the best minds in the machine learning industry to solve a specific problem: How do you read loosely structured data, look for a number of key attributes, and then create a structured output based on those key attributes—all in near real time. The goal is to use advanced machine learning technology as the foundation to streamline the solution for a complex problem. Further, to remove the technical complexity through an intuitive user-interface that allows anyone to manipulate the structured output without knowing developer languages like HTML and JSON. There are numerous opportunities to deploy this advanced solution to create real value for users including event postings, restaurant websites, product pages, business pages, software applications, and articles among others. Currently, Jobiak is focused on a very real problem facing the recruitment industry. Jobiak is first applying this advanced machine learning algorithm and process to the recruiting industry which is currently under siege from many different sources. Most notably, Google has launched Google for Jobs which is threatening the very process by which recruiters and talent acquisition teams have typically posted their jobs and sourced candidates. Recruiters who are rarely technical, and rarely have access to development resources, are now required to add complex HTML schema tags to their job posts to ensure that their jobs are available on the new Google for Jobs platform. Solutions to date have involved expensive developer API integration tools, paying to post each job to an external job board that has integrated with Google for Jobs, or relying on the recruiter’s rigid Applicant Tracking System. Each of these options are either cost-prohibitive at scale, or create a less-than-optimal candidate experience. Jobiak has removed this friction by training its platform to automatically identify the attributes that Google requires to appear in the job posting tags; including the date posted, description, salary, employment type, hiring organization, job location, title, and when the job is valid through. Once identified, Jobiak automatically structures the data into the required HTML tags, embeds the tag within the job posting, publishes the page to the web, and then signals to Google to crawl this new job post. Our direct connection to Google means that customers using our jobs platform can see their job post appear in the Google for Jobs search results within hours, if not minutes. Recruiters and talent acquisition managers using the Jobiak platform utilize a streamlined review portal to confirm that attributes are correct, or make adjustments to further optimize their listing. Even if changes are required, at no time does the user interface with the HTML code tags, our translation engine automatically factors the changes and regenerates the required code. Jobiak’s machine learning platform consists of advanced machine learning algorithms, robotic processing automation (RPA) systems, and uses several W3C specifications such as XML Path Language (XPath). Our tagging platform is based on a prediction engine that uses a wide range of machine learning algorithms like supervised algorithms, unsupervised algorithms, and topic modeling approaches. Jobiak’s system is built upon extracting observations and knowledge from a comprehensive and unique dataset. For job postings, Jobiak collected a massive historical archive with millions of job postings and trained the algorithm through this high-quality data set. However, Jobiak goes beyond building machine learning models. Our technology is also fully automated starting from the data collection processes. The most advanced RPA solutions are implemented in order to capture data posted on job-related sites. Because job posting are substantially variable in content, form, and organization, our technology interacts with each source to learn, discover, and personalize predictions per employer. 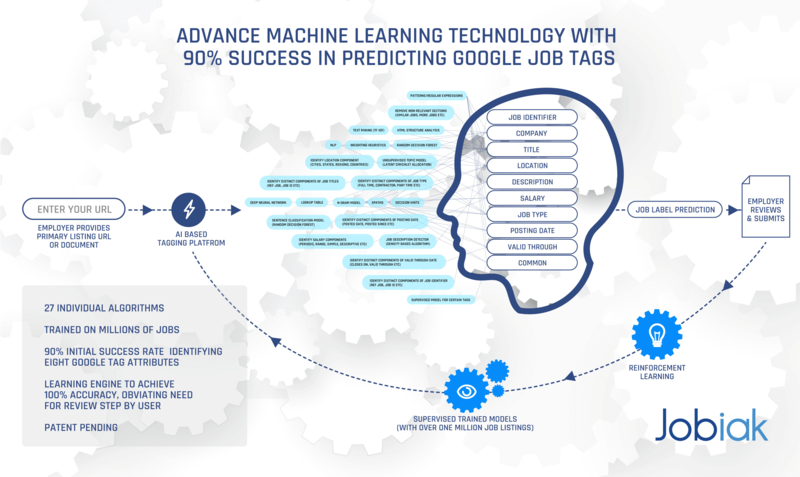 This results in a powerful adaptive prediction solution that acts efficiently and intelligently for different sources or employers and adapts its tag prediction to the writing styles used by different employers. To read more about how Jobiak is streamlining the process for recruiters to post jobs to Google for Jobs, visit our blog.